This War of Mine: Stories benefits from presenting a smaller, more focused story about the casualties of war. Back when This War of Mine debuted on mobile in 2015, I was simultaneously impressed with its hard-hitting depiction of what being a casualty of war could be like and put off by the game's deep, abtruse, and directionless survival mechanics. This War of Mine: Stories fixes all of that, and makes for an experience that feels much more powerful and compelling, though quite a bit smaller in scale than its predecessor. 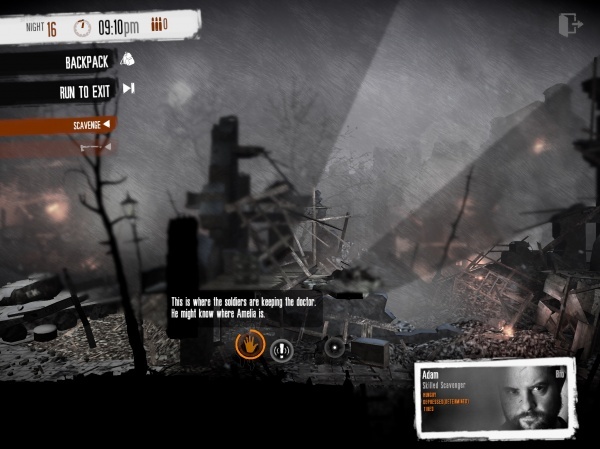 This War of Mine: Stories isn't so much a continuation of This War of Mine as it is a spin-off. It uses the same assets and real-time survival mechanics as the original game, but here they're re-tooled to tell a specific story about father and daughter's struggle while being caught in the crossfire of an international conflict. The game's central conflict centers around the disappearance of Amelia, the sickly child of a man named Adam. Adam and Amelia have lost all of their other family in the conflict already, so This War of Mine: Stories has you play as Adam in his increasingly desperate attempts to find her in bombed out hospitals, schools, and more. As a result of the game's focus on a central narrative, The War of Mine: Stories has the feel of an adventure game with survival mechanics, rather than a procedurally-generated survival game where the systems make your story for you. For me, the addition of more intentional storytelling makes This War of Mine: Stories a bit more approachable and palatable to folks that tend to stay away from survival games. The reason all of this feels more accessible is because this game seems to prioritize delivering its story over making you engage with its survival systems well. 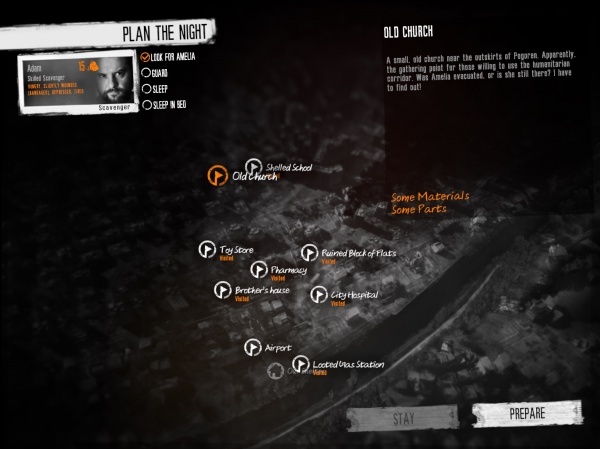 It's not exactly clear how far the game goes to ensure you can't fail, but I can say with certainty that in my playthrough of This War of Mine: Stories Adam hardly slept or ate at all and I never once hit a fail state in the game. For survival game enthusiasts, it might not be particularly exciting to hear that This War of Mine: Stories somewhat trivializes its survival mechanics. This ends up being a smart move though, because the story the game tells is excellent and heart-wrenching, and it just wouldn't hit as hard if its pacing was disrupted by game over screens that force you to replay sections of it over again. The only other potentially worrisome point about This War of Mine: Stories is that it's not a terribly long game. Full days in the world of This War of Mine take about 15 minutes to complete, and I finished the game in a little less than 20 days (for a play time of about five hours total). That said, I'm glad This War of Mine: Stories didn't waste my time in padding out its story. That made every moment all the more special. Plus, if you want a longer version of this kind of game, This War of Mine already exists. Alternatively, This War of Mine: Stories also has a few decision points in its story where you can move the story forward in different ways, which could give you a reason to revisit it at some other time and still come away from the experience having done something new. I'm glad something like This War of Mine: Stories exists, because the original game sometimes got too caught up in its systems that its harrowing subject matter could sometimes be lost. There were whole playthroughs of the original This War of Mine where I felt like my survivors were suffering more from the game's refusal to explain the ways in which I could help them than the actual horrors of war. This War of Mine: Stories flips the script on that experience, and I couldn't be happier with it. This delivers everything I wanted out of the original game and more, despite not being as open-ended or replayable.